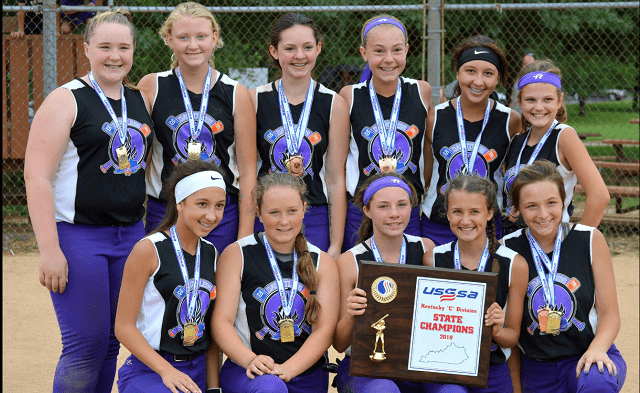 Congratulations to Dauntless, the USSSA Kentucky State 12U Champions! The girls went undefeated on the weekend due to their excellent defense, solid pitching, and strong skills at the plate. Team members are (Top, left to right): Emma Shelton #22, Chevelle Henson #70, Elizabeth Staples #48, Carson McReynolds #9, Jordyn Bayston #55, Layla McDowell #8. (Bottom, left to right): Jayda Bayston #24, Gracelyn Darnall #33, Madyson Morton #7, Anna Vasseur #7, Briley Buchmeier #8. All players attend Marshall or Calloway County schools. The girls are coached by Nathan McDowell, Lyne Dickey, Ryan Morton, and Shane Darnall.